Bible trivia games are great for youth group. Here is one list of questions and answers on a Christmas theme for your youth group or children’s ministry Christmas outreach party. Every December, try to mix up your Youth Group nights for both Middle School and High School by using a mix of fun and meaningful youth group meetings/nights/activities, whatever you call them. 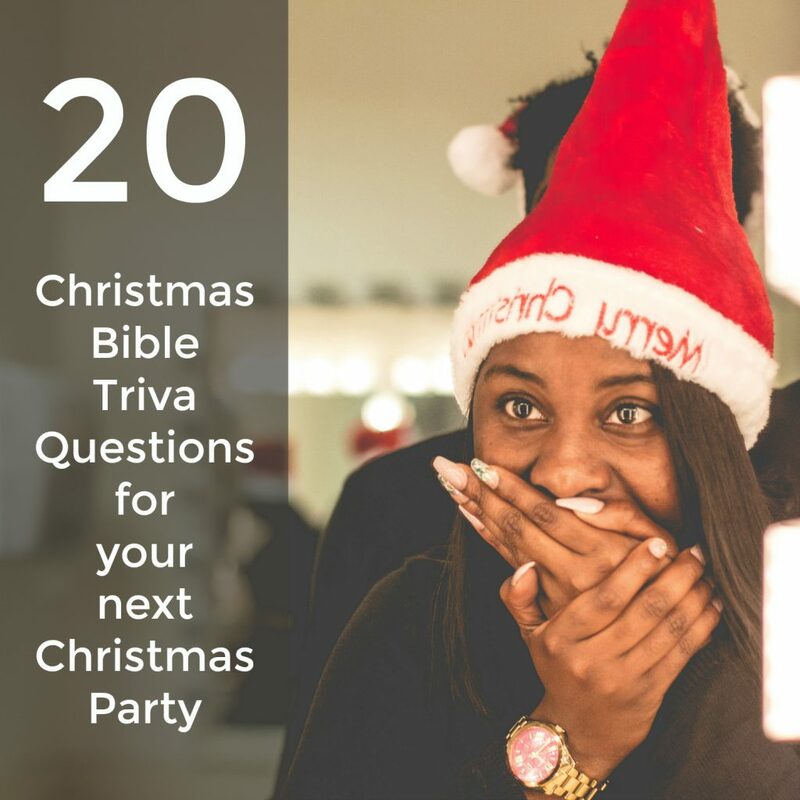 If you have a Christmas Party night for your youth ministry, make this one of the games in your game night, maybe after an outing or a mall scavenger hunt, or simply a party ice breaker. Who told Mary and Joseph to go to Bethlehem? True or False: Mary and Joseph went to Bethlehem for the birth of Jesus because they were following a star. What form of transportation did Mary and Joseph use to get to Bethlehem? The answer is not a taxi cab. Which Old Testament prophet had the most to say about the birth of Christ? In the accounts announcing the birth of Christ (Matthew 1 and Luke 1 and 2) how many times did an angel or angels appear? Who told Joseph the baby’s name was to be Jesus? Can you list 5 names of Jesus found in the Bible? Some on my list are from Old Testament prophecies. What are the meanings of the names Jesus and Emmanuel? The shepherds and the wise men went to see Jesus. Which group followed a star and which group went to find the baby because an angel told them where to look? What did the angels sing to the shepherds? When the shepherds went looking for Jesus, what was the sign they were to look for? How many wise men or kings or magi came to see Jesus? Matthew 2:8 says that Herod asked the wise men to inform him where the baby Jesus was. Why does this verse say he wanted to know? What are the three gifts which are mentioned being given by the wise men? Which emperor ordered all the young children be killed? What animals does the Bible say were present at the birth of Jesus? What was the name of the unkind innkeeper who would not allow the pregnant Mary to lodge in his inn? What is the name of the priest who was told he would not die until he saw the Savior? Two of the four Gospels do not mention the birth of Christ. Which two? Caesar Augustus. He ordered the people to go back to the city of their forefathers. Joseph’s family was from Bethlehem. Luke 2:1. False. As in the previous answer, they went not because an angel told them or because a star led them. They were obedient to the established governmental authority. The Bible does not say how they went from Galilee to Bethlehem. It was an 80 mile trip for them. It is likely that they rode some type of animal, but the Bible gives no details. It is commonly depicted that Mary rode a donkey while Joseph walked along side. But that is simply an artistic depiction. We don’t really know. The book of Isaiah has much to say about the birth of the Savior. If you have ever heard the oratorio by George Handel called The Messiah, you have heard many direct quotes from the book of Isaiah concerning the birth of Christ. At least 3 angelic announcements for the birth of Christ and 1 for the birth of John. For Christ an angel appeared before Mary and Joseph individually and a multitude of angels spoke to the shepherds. For John’s birth announcement in Luke 1 Gabriel appeared before John’s father to announce the birth of John the Baptist. Matthew 1:20-24; Luke 1:11-20; Luke 1:26-38; Luke 2:9-15. An angel in Matthew 1:21. The Bible does not say that this was Gabriel; however, it is assumed to be him since he was the one specifically mentioned as the messenger to Mary and Zacharias in Luke 1. Jesus, Emmanuel, the Christ, Wonderful, Counselor, the Mighty God, the Everlasting Father, the Prince of Peace. Isaiah 9:6; Matthew 1:21, 23. Jesus means Savior and Emmanuel means God with us. Jesus is the same name as the Old Testament name Joshua which also means Savior. Matthew 1:21, 23. The shepherds followed the instructions of the angels in Luke 2:9-15. The wise men followed the star to find the place where Jesus was. Matthew 2:1, 2. Technically angels are never said to “sing” in the Bible. Each time they appear they only speak. However, to answer the question, the angels praised God with these words: “Glory to God in the highest, and on earth peace, good will toward men.” Luke 2:14. A baby, wrapped in swaddling clothes, lying in a manger. Luke 2:12. The Bible does not say how many wise men there were. Tradition says there were three because of the three gifts. There are even names given to the three wise men in different countries and cultures, but we don’t really know their names. It is also very likely there were many more than just three. So that he could worship the child. But we know that his intentions were far from worship. Matthew 2:11-18. It is certain that Jesus was somewhere between a month old and a couple of years old. The wise men saw His star at his birth and began following it. If the journey was 500 miles from Persia and Mesopotamia (around modern day Iraq) then it would have taken at least a month. By the time they arrived Jesus and His family had moved into a house. Later in the story Herod ordered all the children aged 2 years and younger to be killed. Therefore, Jesus was at least a month old and not yet 2 years old. Matthew 2:9-18. Gold, frankincense and myrrh. Matthew 2:11. This was Herod. He ordered all the children in Bethlehem and the outlying areas who were 2 years old and younger to be killed. However, Jesus and His family had already moved to Egypt (Matthew 2:13). In the New Testament accounts of Christ’s birth there is no mention of any animals. However, Isaiah 1:3 could be a prophecy talking about at least a donkey seeing the crib of his Master (God). It could allude to the fact that an ox was there too. If a bunch of shepherds were there, one would assume sheep would have been present. But there is no definite list of animals mentioned in the Bible. The Bible does not say. Nor does it even say that they were inhospitably turned away from an inn. It just says there was not room in the inn at Bethlehem. There may have been many hundreds of people camping in the streets and countryside during the mandatory census. Luke 2:7. Neither Mark or John tell the story of the birth of Christ. FYI, one of the answers is based on a very educated guess and may not be completely true. I challenge you to figure out which one that is and come up with a better answer in the comments below. 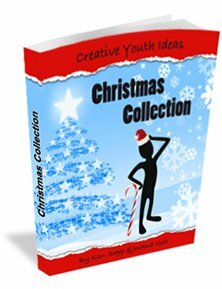 This 370+ page ebook would be a perfect help for someone looking for fresh and creative ideas for Christmas parties games for their youth group or young adult outreaches. I own my own copy. These party games for Christmas have suggested locations (indoors, outdoors, field, table, etc) and suggested energy levels (laid back, sits down, or high energy, as examples). You get a list of resources that you will need to play this Christmas party game. Then you or the game leader get clear directions to follow. Several entries have variations on the theme game so they can be multi-faceted. You get some potential talking points to break the ice, dig deep, and open ways to talk about the meaning of Christmas. Instantly Searchable (do That! with a real book), even if I search my laptop hard drive for “candy cane” I’ll find this ebook. Available on my laptop or, phone, or anywhere else I have a PDF reader. Using no space on my crowded book shelf. Digital —- Imagine a 337 page brick taking up space to use it 1 month a year. Downloadable instantly – no shipping costs. Printable – I can print the game I want, not bend the spine of a physical book to make a copy for my leaders. I ordered the Creative Youth Ideas, Christmas Collection book, charged my card, but the page to download the book says that page does not exist. Please contact me asap!